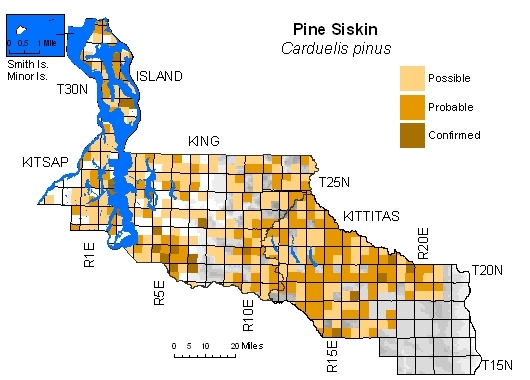 Common and widespread in all conifer and mixed forests throughout four-county area. Numbers and distribution vary greatly between years depending on cone crop. 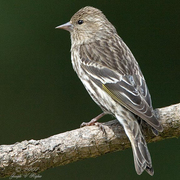 BBA records appear to demonstrate Pine Siskin to be most densely distributed in dry-forest zones of Kittitas County. Relatively low level of breeding confirmation could be due to preference for placement of nests high in canopy, but may also reflect sporadic nature of breeding, with nests concentrated opportunistically near favored food sources, located through erratic wanderings.